Swatch has teamed up with Kidrobot to create a super cute collection of eight watches in the Gent model. Eight artists have contributed to the new collection, each with a characteristic design for a Gent and its accompanying 3-inch Dunny: Frank Kozik, Jeremyville, MAD, Tilt, Tara McPherson, SSUR, Gary Basmen and Joe Ledbetter. Which is your favorite? I can’t even choose, I love them all! 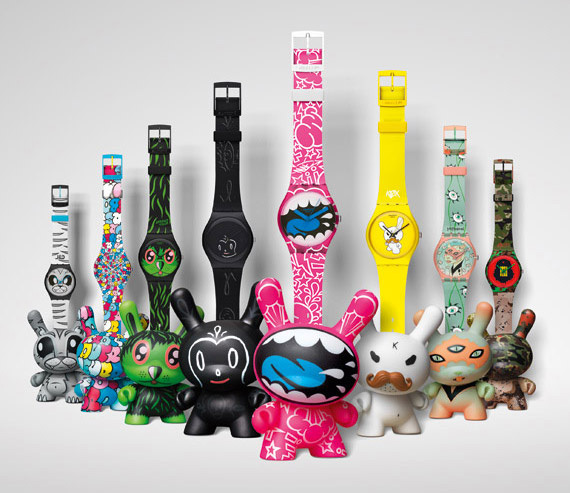 The Kidrobot for Swatch collection is currently available at Swatch stores either separately, in which case each model comes with its complementary Dunny, or as part of a special Kidrobot limited and numbered edition of 300 sets. Each Kidrobot Special Set (GZS48) is comprised of the eight Kidrobot watches in the collection, each watch in the set carries its limited edition number (001/300) and is presented in special packaging together with its corresponding Dunny. Eight of the Dunnys are 3 inches high, while Frank Kozik’s mustachio’d white Dunny comes in a special 20-inch high version.